So a few weeks ago, Sara Irene Smith tossed out a challenge to her social media partners in crime regarding Earth Day and her company’s product. Sara is the founder of Wrappily, a company that advertises itself as offering “chic gift wrap with an eco-friendly twist.” Oh, save me a couple hundred words by checking it out yourself here and then come back. 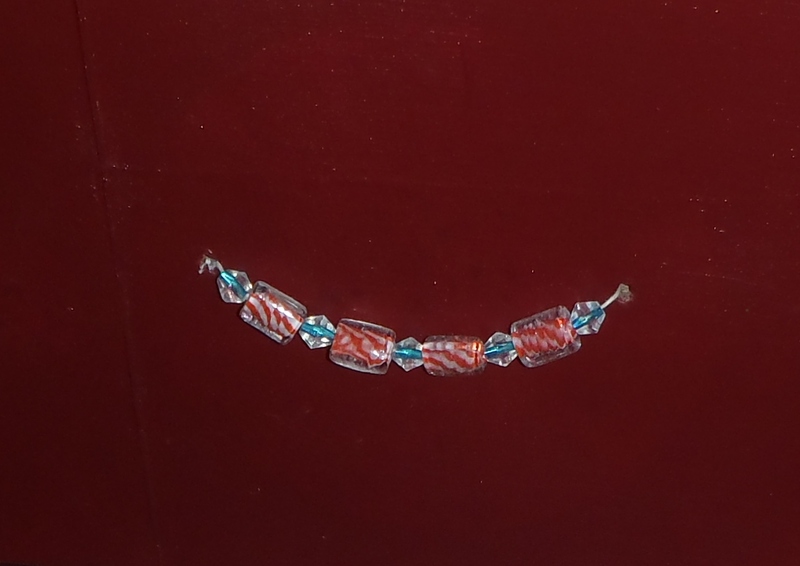 She offered to send a supply of gift wrap to anyone who was willing to use it for a project and photograph the results, to be used in conjuction with Earth Day. Of course I raised my cyber hand. Couldn’t find the right piece of furniture at Salvation Army so I decided to re-vamp my own little beat up particle board night stand. I think I bought it as a do-it-yourself piece of furniture for my son’s first bedroom. He turns 21 next month. So…. My bedroom is an odd assortment of pinks and burgundies, so I figured I’d make this match. 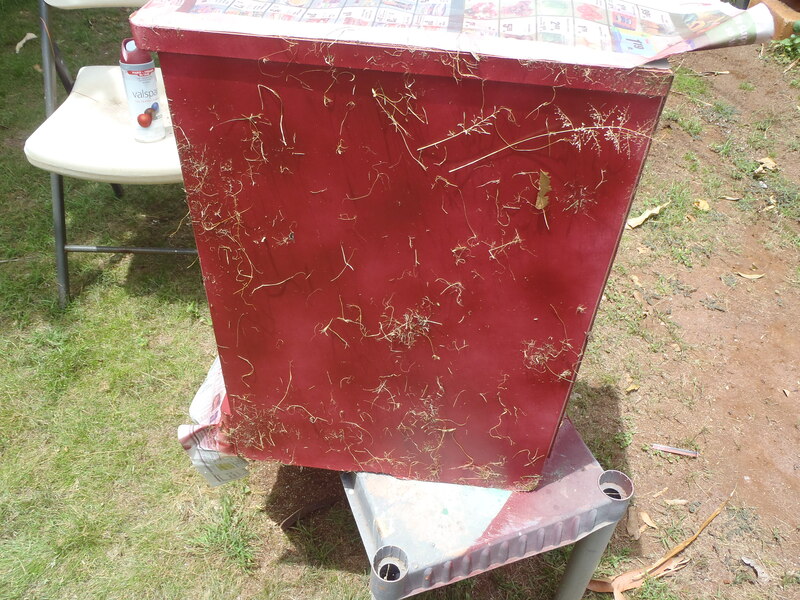 First step: spray paint. Second step: remember to not leave a heavy piece of particle board furniture on a flimsy plastic platform. It fell over and took me forever to unstick all the grass from the side. Yes, I swore a lot. After painting all areas except the ones that I planned to cover with the Wrappily paper, I was ready to begin. The paper – which has a different print on each side, btw – had soft creases, as gift wrap does. 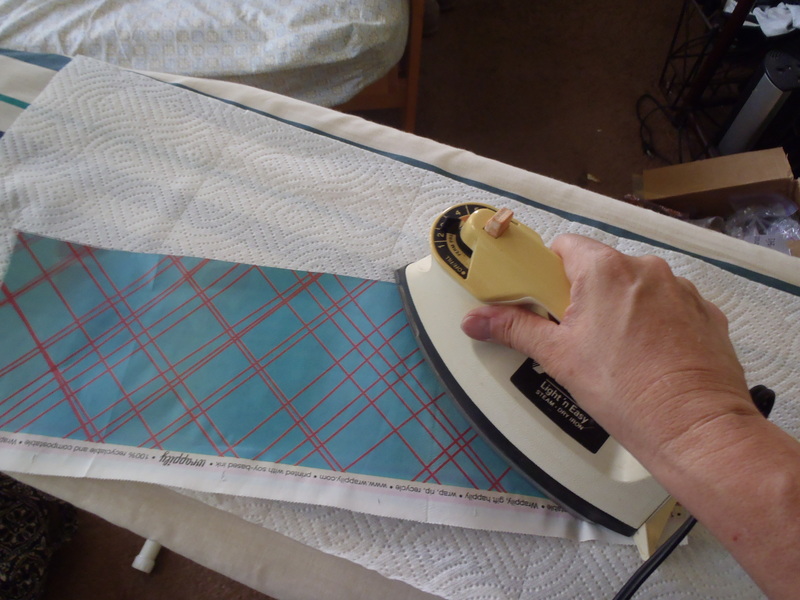 For this project, I decided to iron the sheets, to smooth out the lines a bit. Note: this is the opposite side, and also a very cool print. Normally I use a heavier paper, so this was challenging. It’s newsprint, which is PERFECT for gift wrap but a little light for Mod Podge-ing. But I’ve done it a lot so I made sure to give it plenty of drying time between coats. 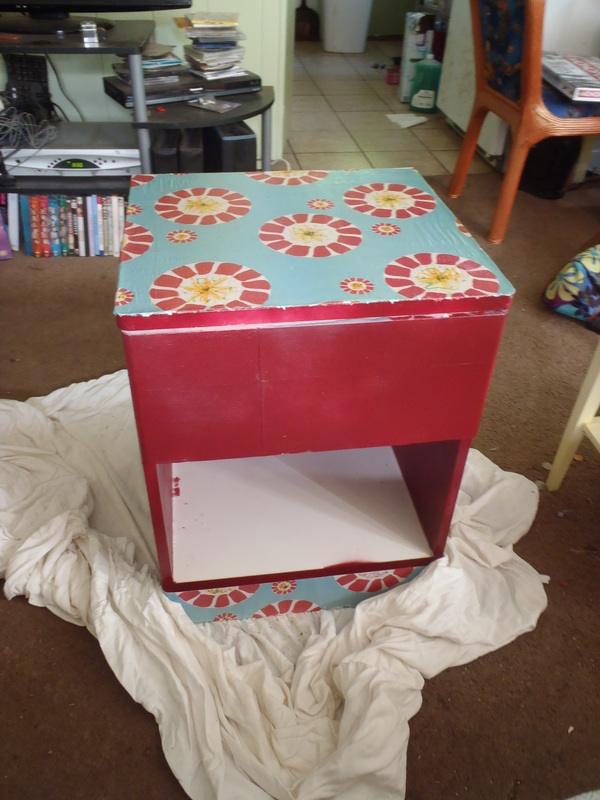 Originally, my plan was to use the paper on the top, drawer front, and bottom skirt panel. But when I did it, although I liked the look in general, I knew it would be too much for my room. I simply have too many other crazy designs going on in there. Isn’t that cute? I really like it. Cautionary note about beads as drawer pulls – make sure that whatever material you use to string them is strong, and likewise for the method of fastening it. I strung them on a hemp cord (hemp is nearly indestructible) and knotted it like a sailor on steroids, on the inside. I still would like to do some sort of finishing around the top edges, where the particle board has gotten a little funky, but haven’t figured out what or how. But I will. 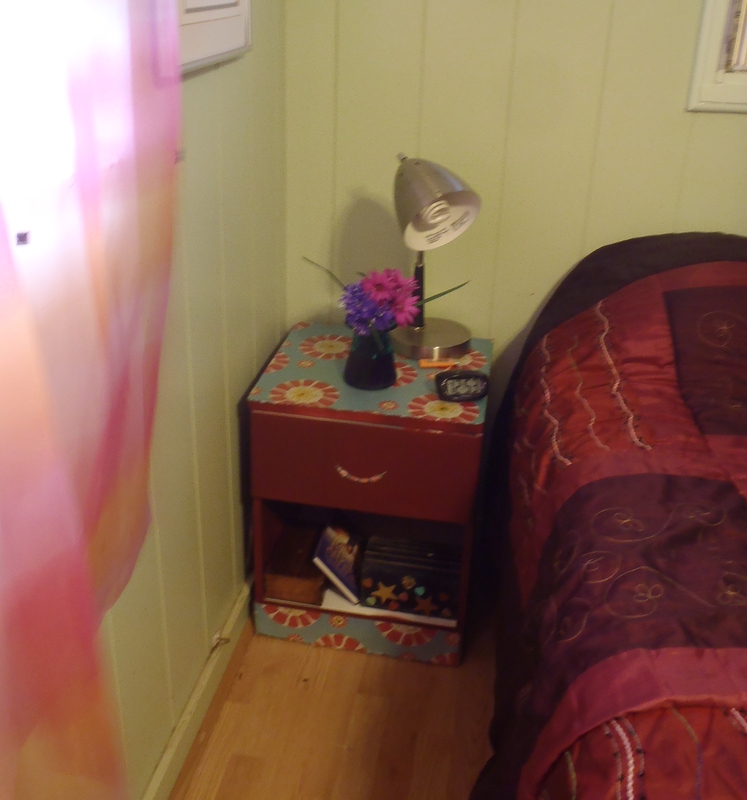 In the meantime, I love my spiffy little updated nightstand, and am now happily a Wrappily customer forever. Sorry, had to do the “happily Wrappily” thing. Couldn’t resist. Anyway … Mahalo, Sara. That was fun! 8 Responses to "Wrappily Entertained"
What a great transformation! I’ve been introduced to Wrappily before through a friend. Great stuff. Love their prints and eco-friendly mission. It’s a great product, Sara. Mahalo, Jen! 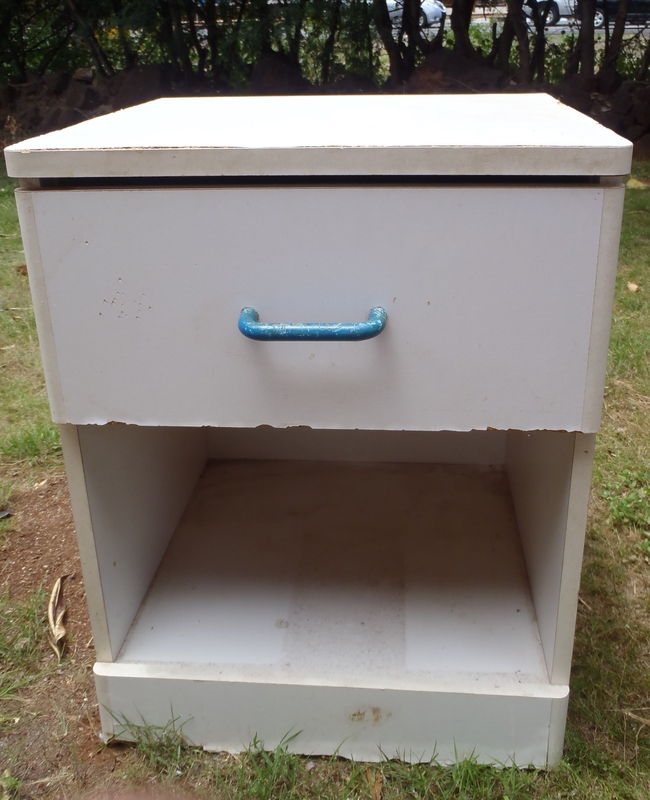 I do old dilapidated cheap kine furniture, so I can play and not feel pressured by how it turns out, lol. very cool. did you put some sort of clear coating over it? just curious how well paper adheres to particle board. The soft texture of the paper was tricky, re: applying it (trying to avoid buckling) but once I got it on, it was fine. 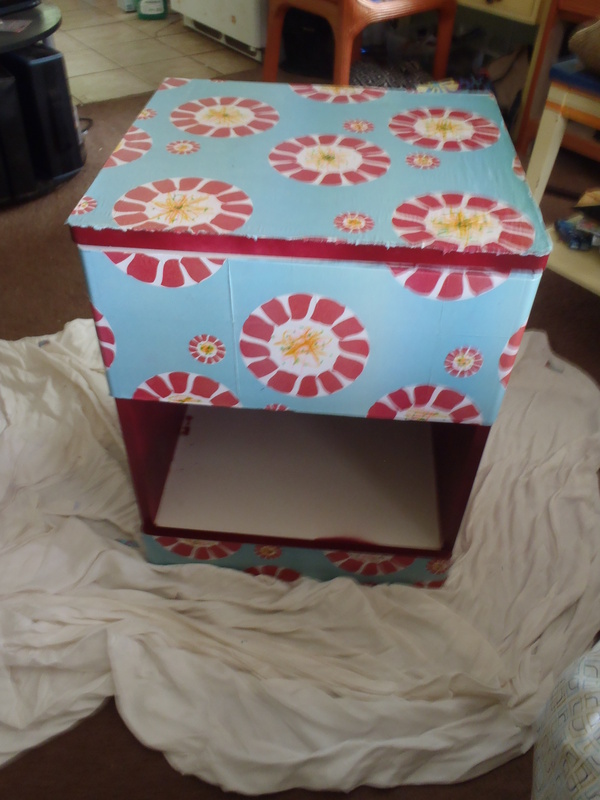 I did about three coats of Mod Podge over it, and SHOULD HAVE finished with something like a Varathane spray, but didn’t. Mahalo, Cara.